As a follow up to the previous post I’ve spent some of this weekend looking for the results which might shed some more light on the genetic impact of Germans on the British landscape between ~500-600 A.D. 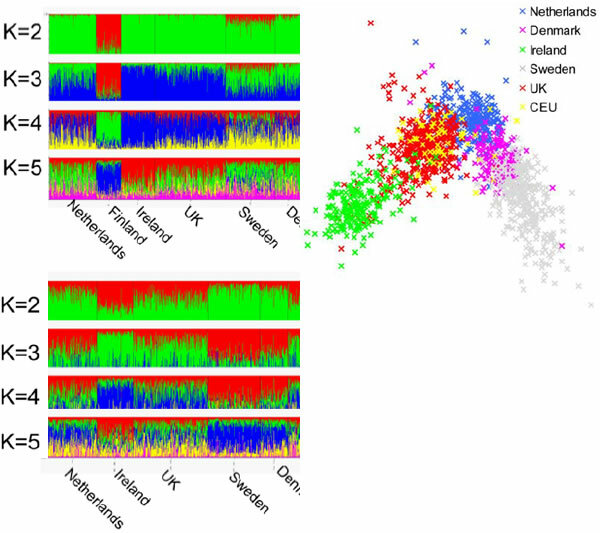 There are some problems here even assuming all other conditions are met: Northwest Europeans are already genetically rather close. This does not mean you can not distinguish an Irishmen from a German, but, once you take into account the clinal variation in gene frequencies due to isolation-by-distance models it becomes somewhat difficult to ascertain admixture in the spaces in between. After all, populations spatially between northern Germany and Ireland, the Brythonic Celts, are presumably going to be genetically between these two populations as well. That being said, space is not the only variable. Culture is another. The Celtic dialects spoken in Ireland and Britain are extremely distinctive, being of two branches of the broader language family, but there was still a clear resemblance between the two cultures (e.g., druids and other aspects of religion). In other words, the Celtiberians of Spain, the Galatians of Anatolia, the Gauls, and the various peoples of Britain in Ireland, all traded in a common cultural currency. 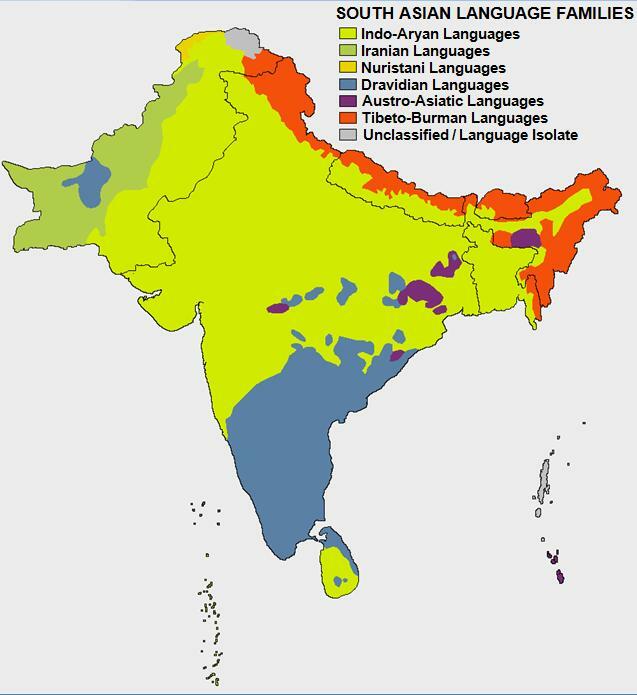 Not only are they likely to have had some common ancestors, but there is going to be a dialect continuum across much of this cultural zone, facilitating continuous gene flow. And speaking of continuity, the fact that Britain is separated by water from the European mainland and Ireland is at least something that works in favor of genetic inferences, as that is a structural constant which mitigates in favor of distinctions and between group variation. 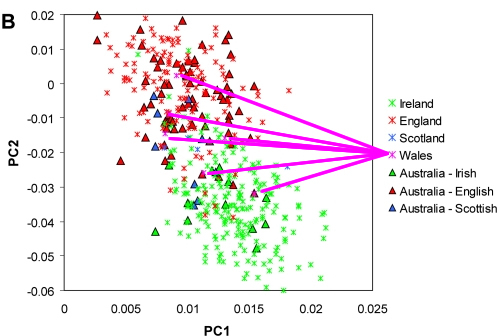 As I stated below, the ideal case would be a data set where you compare genetic variation as a function of geography within the British Isles (with linguistic information intact, so that Welsh speakers are labeled) against a north German reference. The problem with a pooled Northern European reference is that there’s also a “Finnic dimension,” which is pretty much irrelevant when you’re comparing Germans to British. And usually there isn’t the fine-grain that you’d want. Irish are not the ideal proxies for Brythonic Celts. Welsh, or perhaps Cornish or individuals from Devon, might be. The first set of figures are pulled out of the supplements. On the left you have bar plots which show ancestral fractions, Finns and without Finns. The PCA on the right lacks the Finns, but it looks like the Swedes just took up their position. If I could get a hold of the data I’d just run the British, Irish, and Dutch, and leave out the Scandinavians. And if they had more Welsh it would be interesting to see the distance between Welsh, East Anglians, and Dutch. Speaking of which, the second PCA is a close up of the British and Irish groups. I’ve highlighted the few Welsh individuals. The British samples are in between the Dutch and Irish. Why? It could just be location. Or it could be admixture. Knowing where the English samples came from would be a great help. It doesn’t aid things any that many outsiders have settled in parts of Ireland over the past ~1,000 years, and that portions of Wales were colonized by Irish, and finally, that there’s been a large migration of Irish to Britain over the past few centuries. 3 Comments to "Britons, English, and Dutch"
Just to put the recent admixture into context. 1/10 of Britain’s population have at least one Irish born Grandparent (6million people), if you factor in immigration from Ireland since the 1840’s you end up with about 25% of British population (15million) having some Irish admixture. One of the guys that I’m sharing with on 23andme is on the extreme “west” of the Irish cluster, of course he is from the west of Ireland. I wouldn’t be surprised if alot of these studies undersample in the west of Ireland where there is historically the least inflow (as well as largest source of Irish emigrants) — I recall Dublin been used in a number of studies as a source for Irish samples. Given it’s history I wouldn’t necessary regard it as an ideal proxy for wider Irish population. Yes, there has been so much mixing of populations between the islands, that even if they were quite distinct at one time, that distinction is hugely blurred today. As you can see there is little difference between them. Also, my mother shows up as a 100% perfect English sample – though she is about 50% Native Irish. While my father who is Native Irish, also clusters with the English. So are the English heavily influenced by Irish admixture, or are the Irish heavily influenced by English admixture?? The answer is probably both! The exception might be isolated population in places like mountainous County Kerry, Ireland, and maybe some similar terrain enclaves in Wales or Scotland. Both my parents come from the lowlands, and these people – no matter where you go – always seem the most admixed or cosmopolitan. So much so that the only place in the Netherlands where we encountered people who didn’t speak excellent English was Friesland. Probably they just didn’t bother to learn it thinking they already spoke it. Well, they didn’t; they spoke Frisian. Whether they distorted it in an attempt to sound more English, I couldn’t tell. Anyway, they were hard to understand. Yes, just hard, not impossible.